Save your travel details and credit or debit card details securely in your Cleartrip Account and then book all your flights and hotels worldwide with just one click. Expressway allows customers to save their name, address and credit card or debit card details once in their account to enable single-click booking for all future trips. It avoids the tedious process of entering card details , name and address every time they book and helps finish the booking in a blazingly fast manner. What types of bookings support Expressway feature? Expressway supports domestic air, international air and hotel bookings. How can I set Expressway? 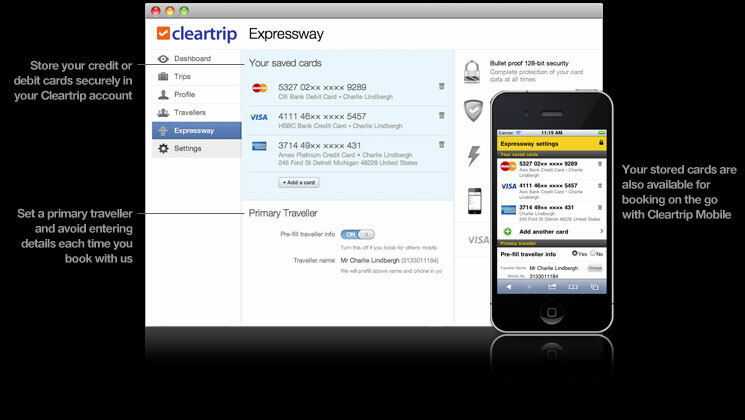 Login to you account on Cleartrip website and go to Expressway setting to start adding a card. First add the card details such as card number, expiry date and cardholder’s name. Then enter the billing address only for Amex or international cards. If you are entering a card for the first time, then you have an option of setting a primary traveler. The primary traveler is meant to pre-fill traveler details during booking if you frequently book for the same person. You can set it to yourself, any other person that you wish or turn it off if you don’t want to set. Now that you have enabled Expressway settings, you will see a list of cards stored in your account along with details of primary traveler. You can also enable Expressway by saving a credit or debit card during the book steps on the payment page. When you enter a new card in the payment page while booking, you can select a checkbox to save the card for future use, thus turning on the Expressway feature for your account. What advantages do I get with Expressway feature? If you have enabled Expressway feature on your account, you will be able to do single-click payments for all your future bookings when you are logged in on Cleartrip site. For 1-pax flight bookings, once you select your flight itinerary, all you need to do is enter the CVV for the card pre-selected based on Expressway settings. This will take you to the payment page where you can enter your VBV/3D-Secure password to complete the payment. You can change the payment card by clicking on edit and adding a new card or selecting a different payment method such as: net banking, EMI and etc. You can also change the traveler name if you want to book this trip for another person. 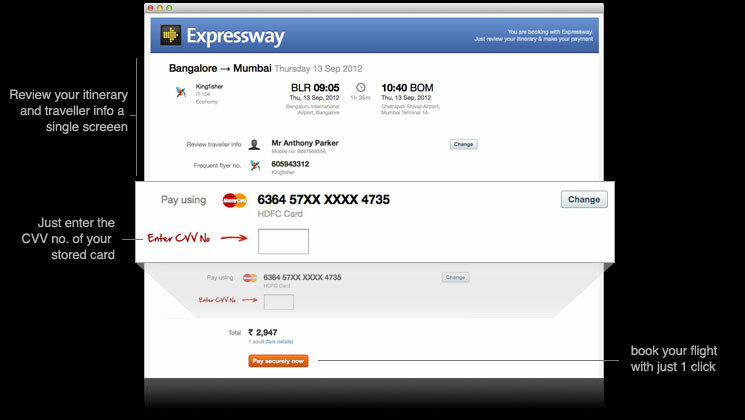 For multi-pax flight bookings, you will be able to take advantage of Expressway feature on the payment page. Can I store more than one card in Expressway setting? You can store as many cards as you want for your convenience. If you have multiple cards saved in Expressway, the last card added will be your primary card for future bookings. This means that this card will be pre-selected by default when you go to the payment section in the bookstep. What card types does Expressway support? Expressway supports credit and debit cards of types: visa, master, amex and maestro. Can I delete a card after I store it? You can delete a card anytime from Expressway settings. Once it is deleted, the card is deleted from our system. If you delete all cards in Expressway, it will automatically turn off Expressway feature on your account. Are my cards stored securely on your system? All your card information is stored in our database on a secure server using industry standard encryption. How safe is Expressway feature? Can someone else misuse my card? We use industry standard 256-bit encryption while transmitting and storing cards in our system, Also, your CVV no. and Verified by Visa / 3D-secure password are not stored in Expressway settings . This feature is completely secure and safe. Does Expressway work on mobile site? Once you store a card using Expressway on desktop site, the feature gets enabled on the mobile site also and vice-versa. This has the advantage of storing it once in your account and then being able to use it from whichever computer or mobile device you are using. Please be assured that only you can view and use the stored cards during bookflow after you login to your account. What do you mean by Primary Traveler in Expressway settings? Setting a primary traveler in Expressway settings prefills the traveler details along with the phone number during book steps. This feature is helpful if you frequently book for one person, be it yourself or someone else. You can always edit the traveler name if you decide to book for another person during the itinerary review page. Get on Expressway now!Start with creating a Cleartrip Account. Get on Expressway now!It seems you already have a Cleartrip account. Please enter your password to sign in. Welcome back It seems you've booked with us before. We have sent you an email with an activation link. Please check your email to activate your account and set up Expressway. You're just a step away. Get on Expressway Now!We need a few details before you can add your card.